He wound up presiding over a crucial period in which the powerful companies of Silicon Valley turned into Washington power players. Lobbying the FCC has become a major economic franchise. Each day, hundreds of dark-suited lawyers crowd the antiseptic, midcentury-modern agency building. Can anyone think this is a good thing? To be clear, I don’t think Genachowski is solely responsible for Silicon Valley innovators getting more aggressive in Washington or for tech lobbying becoming “a major economic franchise” at the FCC. There’s plenty of blame to go around in that regard. Regardless, every legislative and regulatory action that opens the door to greater regulation of the information economy also opens the door a bit wider to unproductive rent-seeking and cronyist activities. Moreover, every minute and every dollar spent focusing on making legislators and regulators happy is another minute and dollar that could have better been spent making consumers happy in the marketplace. It’s a pure deadweight loss to society. Sadly, this situation isn’t going to improve any time soon. As I noted in a 2010 Cato essay (“The Sad State of Tech Politics“) and other essays here (see them below), lobbying by information technology companies is absolutely exploding. Google and Facebook set quarterly records of their own recently, but it’s not just the big dogs like them. Everyone is beefing up. As the politics of the parasitic Belwway economy increasingly replace the cut-throat rivalry of the market economy, consumers and innovation will suffer. once they hire lobbyists and set up lobbying offices and become active in trade associations, they start to see the benefits of political participation. 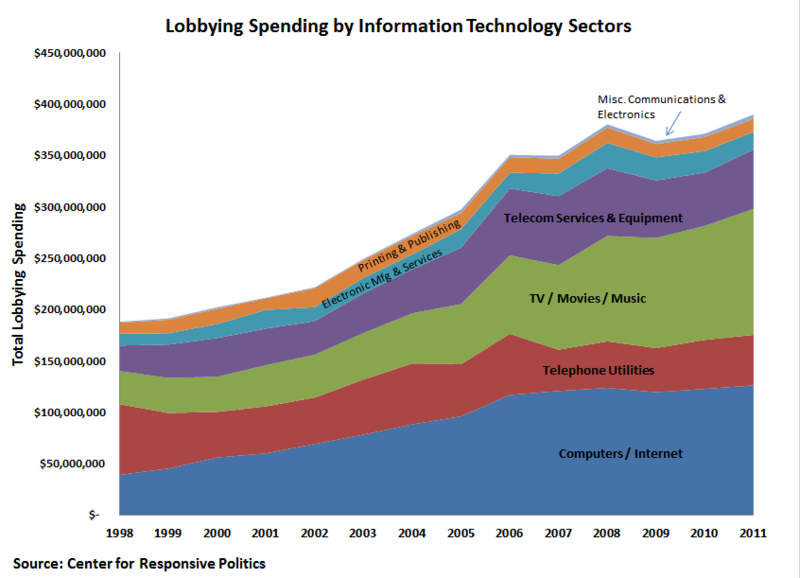 Lobbyists are there to point out new potential opportunities and new threats, and to make the case that being engaged politically is good for the bottom line. Companies get involved in more issues and more ongoing battles. And once they’ve paid the start-up costs of learning about Washington and building relationships, the cost-benefit equation of being politically engaged shifts even more in favor of staying and doing more. 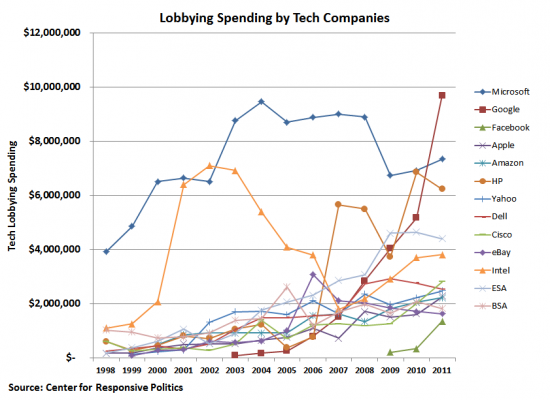 In other words, there’s a sort of “Say’s Law” of lobbying at work: supply creates its own demand. That certainly seems to be true for the high-technology companies and sectors mentioned above. They are falling over themselves in a mad rush to see who can beef-up their lobbying operations faster. They are doing this even though there isn’t always a compelling case for them to be doing so. But it doesn’t make a difference. Lobbying has taken on a life of its own. It is rationalized by tech leaders telling themselves that ‘we either do this or we get screwed,’ all the while being egged on to do so by a professional class of inside-the-Betlway lobbyists, consultants, PR people, trade associations, and reporters who all insist that it’s just the way business is done nowadays — and who all make their money by encouraging the grow of the parasite economy.